Numerous research shows that people trust recommendations from other people they know - and that includes people they know via their online presence. In fact, 92% of 18-to-34 year-olds say they seek recommendations from friends and family when considering a product purchase - which makes word-of-mouth the highest ranked source for trustworthiness. This trust is leveraged via influencer marketing. What if we gave you the secret formula - specially customized for your company - to utilize influencer marketing to drive new business? From high-level strategies to tactical methods, our relationship marketing experts share their formulaic approach to influencer marketing success. Successful brands are using these best practices to optimize their programs resulting in quality over quantity when it comes to influencer marketing. 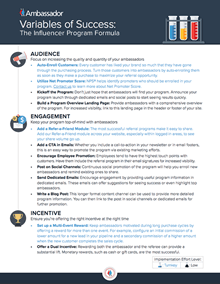 Enter your information to receive your custom formula for influencer marketing success.